Whether you prefer the simplest ring of a single metal or a complex mix of metals in your very own choice of colors & finishes, all are possible with our ring designer. 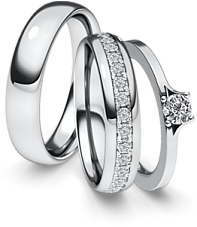 As many or few (round or square) diamonds as you like in whatever sizes will fit in the matching ring design. Choose your style of setting in any width, in any variation of metals and finishes. Select one of several engagement rings and see it with different diamonds. 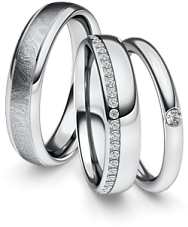 Then if you like design your matching wedding rings. 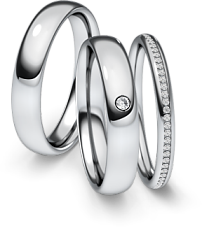 The traditional pair of wedding rings is complemented by a diamond band as an adding ring.